Whether it's a holiday dinner or proverbial family gathering, mashed potatoes are likely to be on the menu. At our house they're known as one of the 4 Cornerstones of Life (meat, gravy, and homemade rolls being the other three). And though mashed potatoes seem simple, they're actually pretty finicky, and surprisingly easy to destroy. Here are the 10 common mistakes that you're possibly making with your mashed potatoes, and tips for how to avoid making those goofs. I found this information in a Huffington Post article over 2 years ago, and was I glad I did! MISTAKE 1: You may be using the wrong potato. Of the three kinds of potatoes (starchy, waxy and all-purpose), you want a variety that falls within the starchy (Russet) or all-purpose (Yukon Gold) realm. 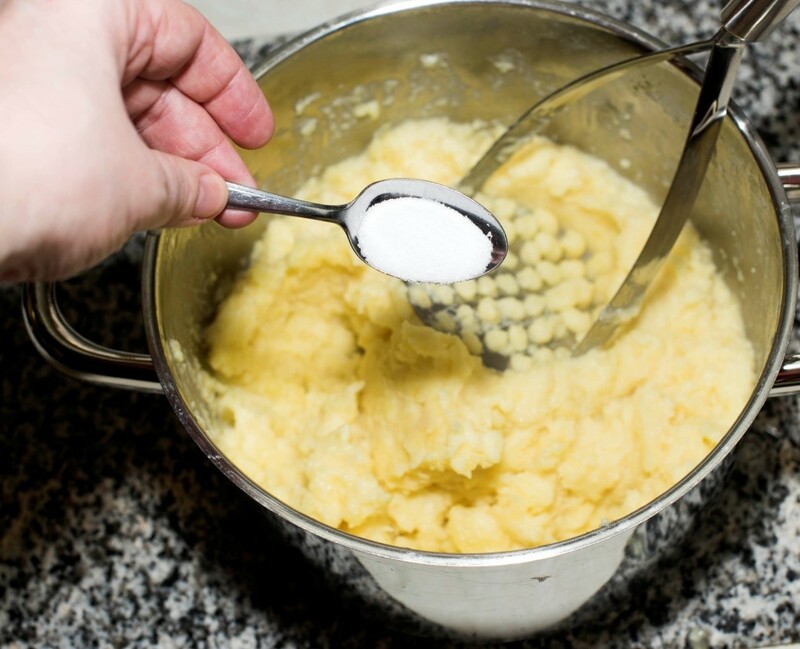 Starchy potatoes break down better, resulting in a creamier mash. NEVER use waxy potatoes (i.e. red bliss, fingerlings, etc.). 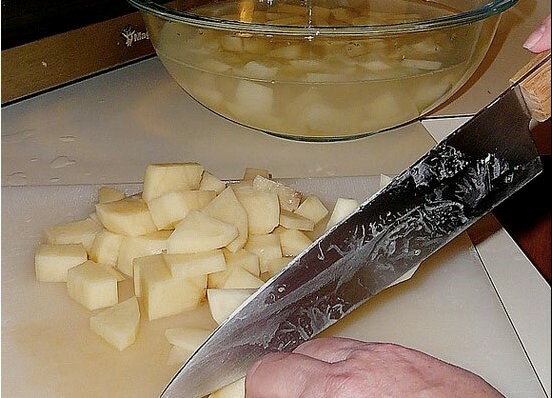 MISTAKE 2: You may not be cutting your potatoes into equal-sized chunks. They won't cook at the same rate if they're different sizes, meaning the larger pieces will be undercooked while the smaller pieces will be overcooked. This does not a creamy mash make. Start with cold water, bring it up to a simmer, and cook the potatoes until they're all uniformly done. MISTSKE 3: You may be over- or under-cooking your potatoes. Overcooked potatoes are mealy, and undercooked potatoes are too chunky to whip into a smooth mash. Neither taste good. You'll know your potatoes are perfectly done when a sharp paring knife passes through the potatoes without any resistance. MISTAKE 4: You may be using a food processor, blender, immersion blender, or hand mixer for mashing. 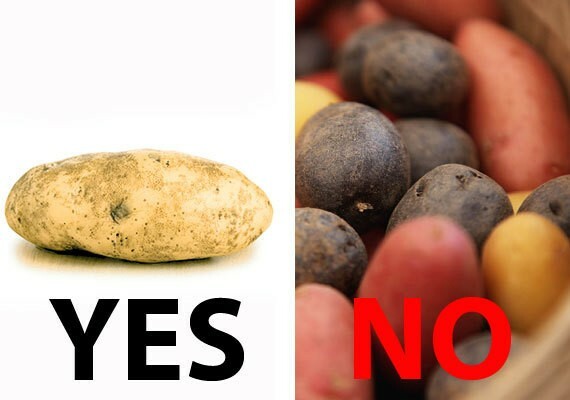 THIS IS IMPORTANT: Potatoes are filled with starch, and starch does NOT like to be overworked. When you handle/mix/beat/whip starch too much, it breaks down and tightens up. Imagine what happens to your fingers when your fists ball up in a fit of rage -- that's basically what happens to the starch in potatoes when you mix them too much. The result is something akin to thick glue, and that's horrible. The goal is light and fluffy. Instead of using one of the aforementioned tools (which are so high-powered that they will most certainly overwork the potatoes), try a potato ricer or a hand-held masher. MISTAKE 5: You may be over-mixing the potatoes, period. 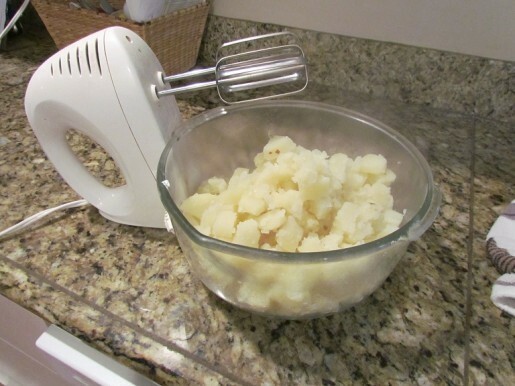 Even if using a ricer or a hand-masher, it's still possible to overwork the potatoes. 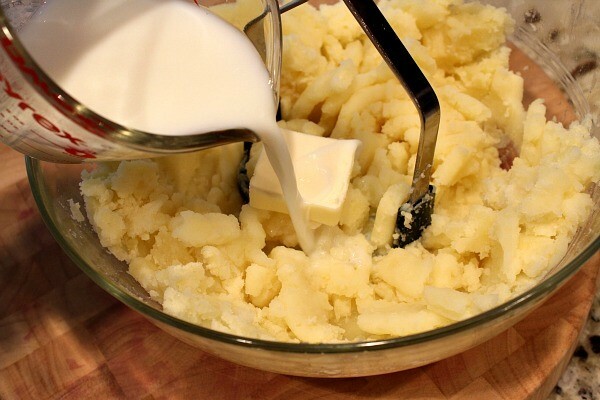 When you're mixing in the cream, milk or butter, gently stir until the ingredients are JUST combined. There's no need to work your mashed potatoes to death. YOU'LL BE EATING GLUE, REMEMBER? MISTAKE 6: You may be using cold butter and cream. You want both at room temperature. This way they absorb better into the hot potatoes and the risk of over-mixing is decreased. MISTAKE 7: You may be adding too much liquid. Follow your recipe (if you use one-we rarely do), but be careful. It's easy to turn mashed potatoes into potato soup. The only way to un-do this is to add more cooked potatoes, which you most certainly won't have on hand. MISTAKE 8: You may not have added enough butter. 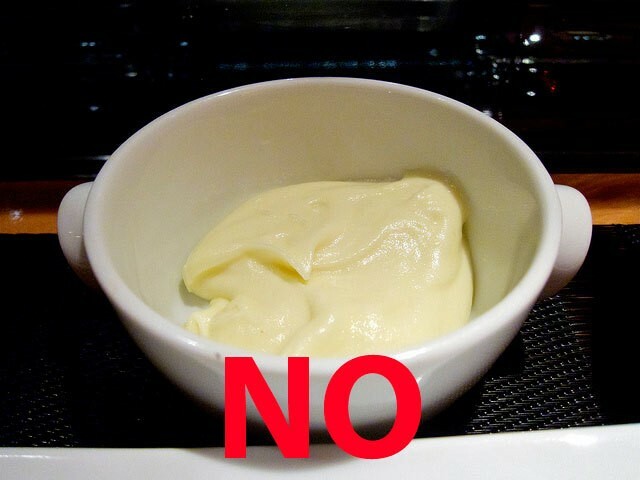 5 Star restaurant chefs concur: excellent mashed potatoes call for a 2:1 potato-to-butter ratio. This means that for every pound of potatoes, you want to use a half-pound of butter. Taste-testers the world over agree as well. "They're perfectly balanced and perfectly heavenly when fixed this way" is the typical comment. And every chef advises: When in doubt, add more butter. MISTAKE 9: You may not have used enough salt. It's Bland City without the right amount of salt. Season your mashed potatoes and, WITHOUT MIXING THEM TOO MUCH (we're getting the point, right? ), taste them and adjust the salt levels until they're to your liking. MISTAKE 10: You may be drying them out. It's OK (but not the best) to make mashed potatoes in advance, but once they've cooled down it's important to heat them up without drying them out. One way to do this: Place your finished mashed potatoes in a double boiler. This will gently warm them through without the risk of scorching the potatoes at the bottom of the pan. You can also add warm butter.